Are you looking for some fun Halloween nail ideas? This is the time of year where you can have an absolute blast getting those nails all dolled up. Between Halloween, Thanksgiving, Christmas and New Years…your nails are just begging for some fun TLC. How about something for FREE to help you get started? Sound good? 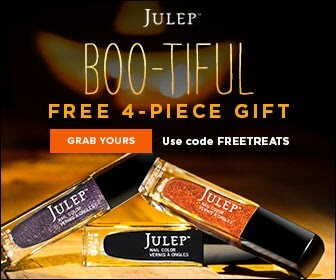 Julep wants to help you with some Spooktacular nail designs using their spell-bounding colors. I have a ton of Julep nail polishes and I love them all. In particular, I have the orange and purple pictured above and they are perfect for Halloween and fall. It’s so fun to receive new nail colors in the mail every month. Julep Maven subscribers get first access to trend setting colors and top-rated beauty products each and every month. For a limited time, new Maven subscribers can get started with this 4-piece Halloween inspired beauty gift valued at $58 for free (just pay $2.99 for shipping). Become a Maven today, use the code FREETREATS to get your own 4-Piece Halloween Themed Maven Welcome Box for FREE (you just pay $2.99 for shipping).